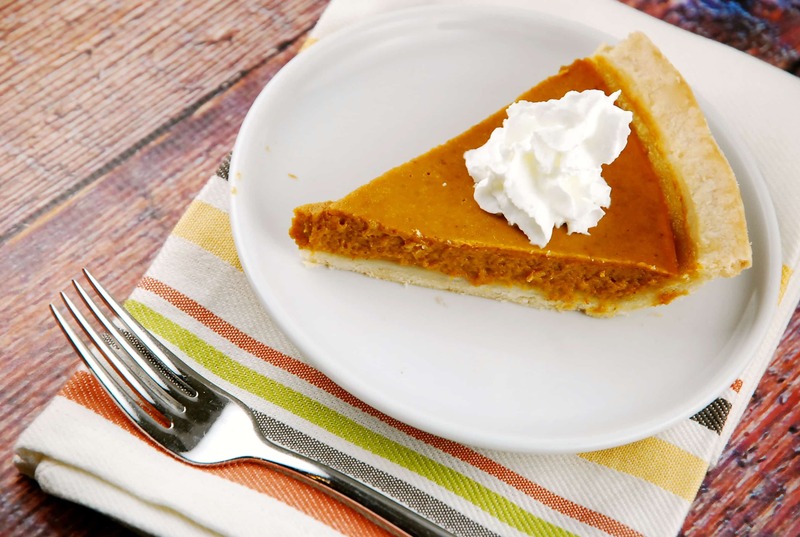 No need to skip dessert this Thanksgiving….just try this healthier, low calorie Pumpkin Pie recipe instead. By making a few small tweaks to my mom’s traditional Thanksgiving Pumpkin Pie, and switching out the high fat crust for a delicious whole wheat version, I was able to make this amazing Weight Watchers Pumpkin pie that is delicious, lovely! Other versions of light pumpkin pie recipes that I’ve seen, suggest going crustless, or, thinning out your crust as much as possible in order to lower that Points value. My response to that? NO WAY!!! I loooooove pie crust. And I’m not about to sacrifice it. But I am usually pretty overwhelmed around the holidays, so I like to keep things as simple as possible. That means I sometimes buy a pre-made pie crust. No shame in my game, folks. I LOVE the Organic Whole Wheat Pie Crust from Wholly Wholesome….it tastes amazing and you’d never know it’s healthier. This is usually my go to pre-made pie crust. But in this recipe, a couple of simple ingredients, and a few extra minutes of time, and you get a delicious, homemade pie crust that is oh so yummy!!! So don’t pass on the pumpkin pie this year, just serve up this Low Points Pumpkin Pie Recipe, and enjoy the guilt free indulgence. Happy Thanksgiving! Has this been recalculated to smart points? I have been baking this pie for 90 minutes now and it is still liquid in the middle. The edges look like they are burning so I took it out of the oven. I followed the instructions exactly. Something isn’t right.